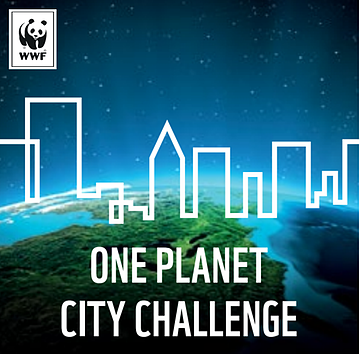 The One Planet City Challenge, previously known as the Earth Hour City Challenge, is an international WWF initiative which invites cities in participating countries to report ambitious and innovative climate actions, and to demonstrate how they are delivering on the 2015 Paris Agreement. Although mitigation of carbon emissions and adaptation to the impacts of climate change must be addressed first and foremost at a global level, it also requires active intervention and support at national government and city levels. Cities are huge users of resources. They consume 75% of the world’s natural resources, 80% of the global energy supply and produce approximately 75% of the global carbon emissions. By 2050 the global urban population will double. Already, over two thirds of South Africa’s population live in cities. Not surprisingly, many believe that the global struggle for sustainable development will be a battle largely waged in cities. WWF created the One Planet City Challenge to highlight solutions to address rising carbon emissions, and to recognise and reward cities that are busy putting them to use. These are cities that aim to provide sustainable housing, transportation, and energy for their residents. Every two years, a yearly invitation is extended to cities to sign up for the challenge and demonstrate their leadership for a renewable and sustainable future. Cities report their commitments and actions on the data platform for the Compact of Mayors - the carbonn® Climate Registry, and outreach and support in the process is provided in collaboration with ICLEI – Local Governments for Sustainability. These commitments and actions are reviewed by an international jury of experts tasked with identifying the most outstanding cities. The most ambitious cities are selected winners at a national and global level and are then recognised at a global award ceremony. WWF works with South African cities. This year, five metros (Cape Town, Johannesburg, Tshwane, Ekurhuleni, eThekwini) as well as two secondary cities (Kwadakuza and Msunduzi) have entered the challenge. WWF International recognised the opportunity to address climate change through incentivising cities through a challenge which would recognise the good work they are doing to reduce their carbon emissions. Since the inception of the challenge in 2011, WWF has engaged over 320 cities across five continents. This year cities in 30 countries are eligible to participate in the challenge, and to inspire the world. South African cities realised an aggressive reduction of carbon emissions and set ambitious energy goals. South African cities implemented best-practice urban planning and technical solutions to support sustainable outcomes in urban infrastructure, water, waste, energy and transport. Rolling out innovative financing to support South African city investment in climate action.